There’s always something new happening in Facebook Land. 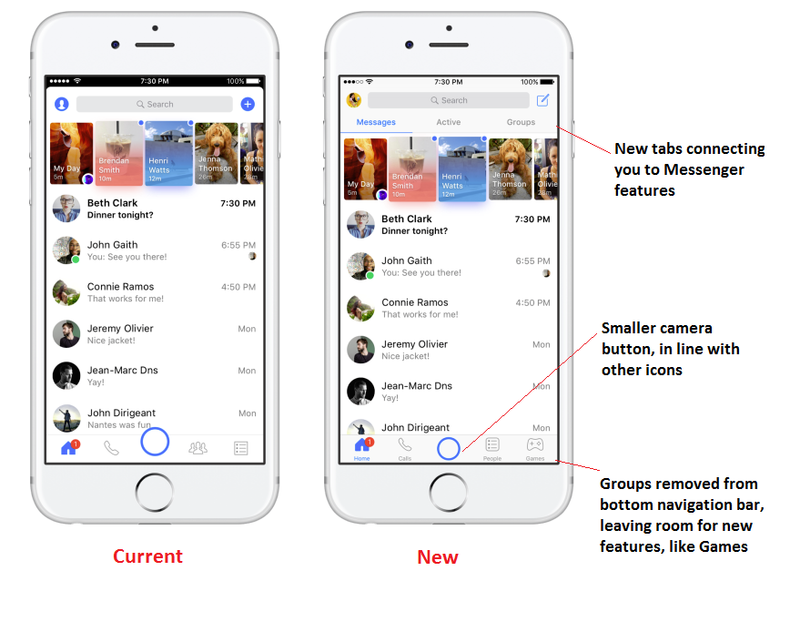 This week, it’s Messenger’s turn to get another tweak – Facebook has announced the introduction of new tabs in the app, and new, specific notifications to better connect you with Messenger’s various functions. Okay, it’s kind of hard to tell what’s new from that image – here’s a side-by-side comparison of the new and old layouts (iOS version). As you can see, the main change is the addition of a new top navigation bar which enables you to quickly switch between messages, a listing of active users, and Groups. Facebook says the changes are designed to make it faster and easier to connect – they’ve been testing the new layout with selected users in the past few months. By moving Groups to the top navigation bar, they now have an extra space along the bottom, where they’re adding in Games, their competitive arcade feature which they first announced last November, but only rolled out to all users earlier this month. As part of the wider roll out, Facebook also announced new games features, including turn-based play, which could make it a much more compelling option (previously, the only way to challenge friends was to post your score and prompt them to try and beat it). It’s hard to say whether shifting Groups to the top bar is a demotion or promotion of the function, but Facebook, in general, has definitely been putting more focus on Group interaction, so it’s likely that, based on research, putting Groups in the top section will give the option more prominence. The same can be said for the camera button, which was introduced in that over-sized format as part of the roll-out of Messenger Day, their Snapchat-clone within Messenger. As part of this update, the camera will be brought back into line with the other icons, which looks better overall, but maybe puts less emphasis on its use. Does that mean Messenger Day is not getting the traction Facebook had hoped, or that it’s now known enough that they no longer feel the need to highlight its presence? We don’t have any definitive data on Messenger Day use as yet, but Facebook Messenger Chief David Marcus did note recently that Messenger Day usage has been going well, with participation rates in line with their leading stories product. In addition to the new layout, there’ll also be new red dot notifications on each section when you have new activity. This will no doubt get more people more active in the app by tapping into the compulsion to stay informed at all times – most would admit, it’s ard to resist that red dot when it’s available. 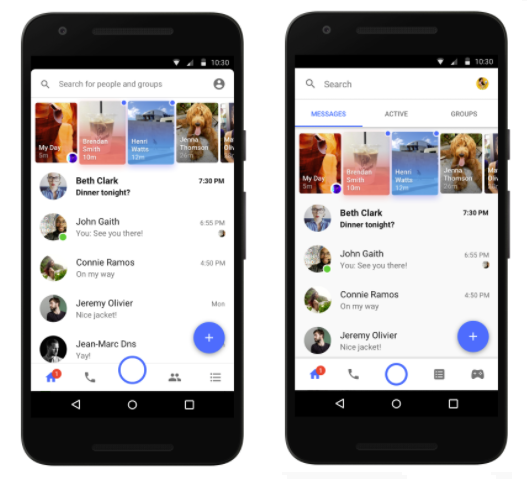 The updates themselves seem relatively small, subtle, but they could have significant impacts in terms of usage and in-app behavior, with each section of Messenger now getting its own focus. Splitting each of the main sections of the app into tabs makes sense, and utilizes more of the available functionality within your mobile device, but it also adds more complexity to an app that is, at heart, a simple messaging tool. But Messenger is now so much more than that, and that’s likely the point. 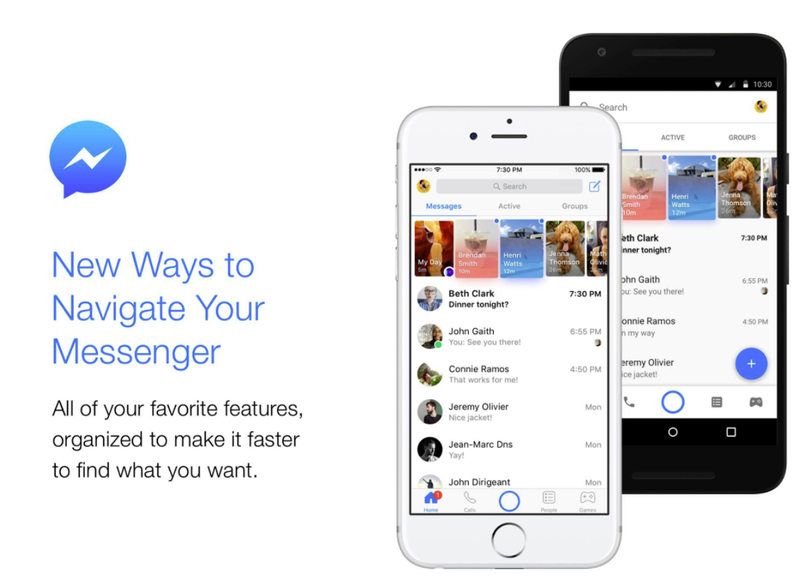 In order to better highlight the many things Messenger can do and be used for, Facebook needs to broaden user knowledge of the available options, which it can only do over time, by introducing new sections and options which highlight these different aspects. In this iteration, they’re only really putting more emphasis on Games in addition to the common tools and options, but every time they add in a new layout change or shift, it prompts users to change their usage behavior and broaden their understanding of what they can do within the app. This then makes it easier for Facebook to add in new tools and notifications for other features – which is especially important when looking to highlight newer functionalities like bots. The update doesn’t change much here, but it’s another usage shift, which is required for Facebook to keep evolving the app and expanding user understanding of what’s possible, what else they can use Messenger for beyond messages alone. 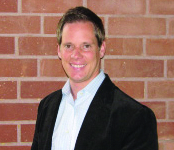 And with 1.2 billion users and growing, expanding on those options will become crucially important. Facebook says the new Messenger changes will be rolling out worldwide on iOS and Android this week.